Currently once a wooden car is restored, there is no place to display or store the car. Mid-Continent has only one building on the property that is currently used for the display of restored cars, the Coach Shed, and that building is filled to capacity (13 cars). Three of the cars currently stored in the Car Shop are fully restored and take up room where other wooden cars could be stored pending restoration. It would be totally impractical to place a restored car outside, subject to the elements, especially a Wisconsin Winter, as the car would have to be restored again in just a few years. The only reasonable solution is to build additional indoor railcar storage and display space. In 2016, Mid-Continent received the final payment from a bequest from the estate of Laurence H. Dorcy totaling $968,046. 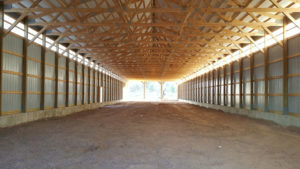 The funds received from the Dorcy estate were restricted, but could be used to build “a structure for the restoration and storage of railroad cars.” The Board of Directors of Mid-Continent approved the building of a new structure, Coach Shed #2. 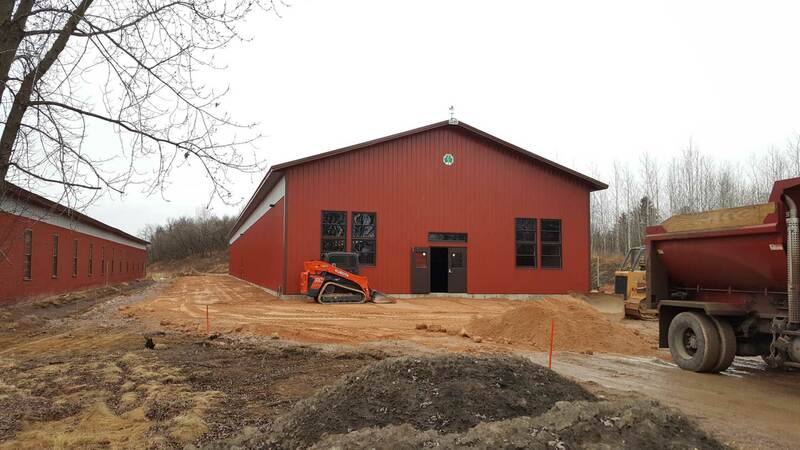 As of February 2018 great strides have been made toward the completion of Coach Shed #2 and it is expected to be completed in summer 2018. Site plan for new display building. 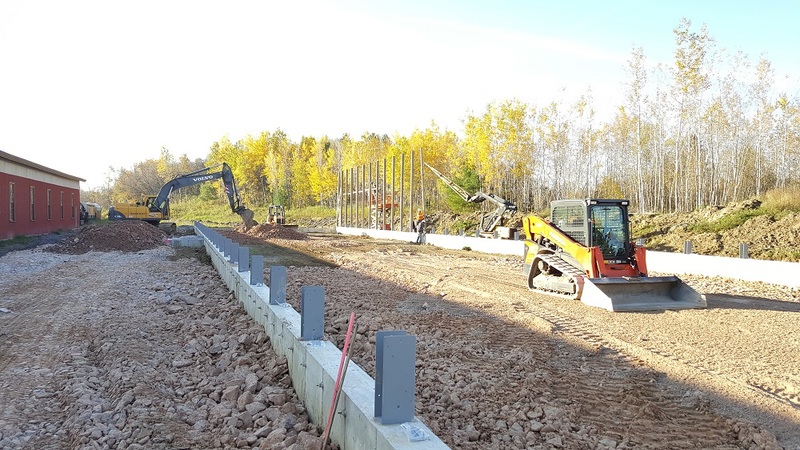 Site grading for the structure is complete and concrete subwalls are poured. Construction of the structure is now underway. The creation of the fire access road paralleling the building is underway as is installation of the subgrade for the interior railroad tracks. 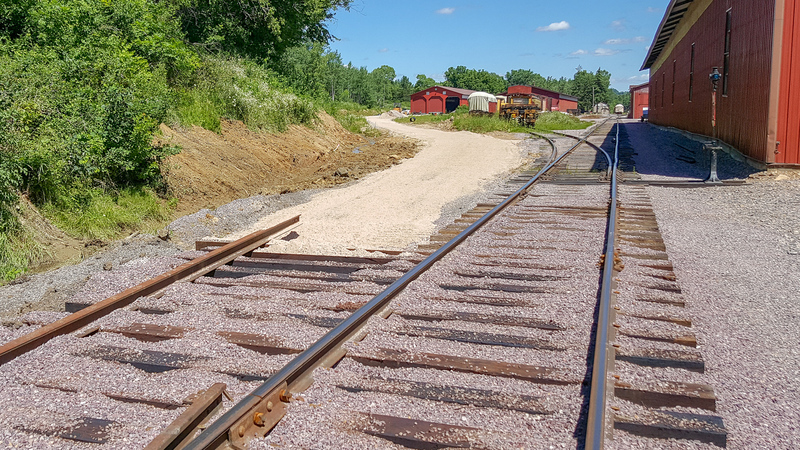 Over 1,100 new railroad ties for the project have been ordered and are expected to arrive in late October. 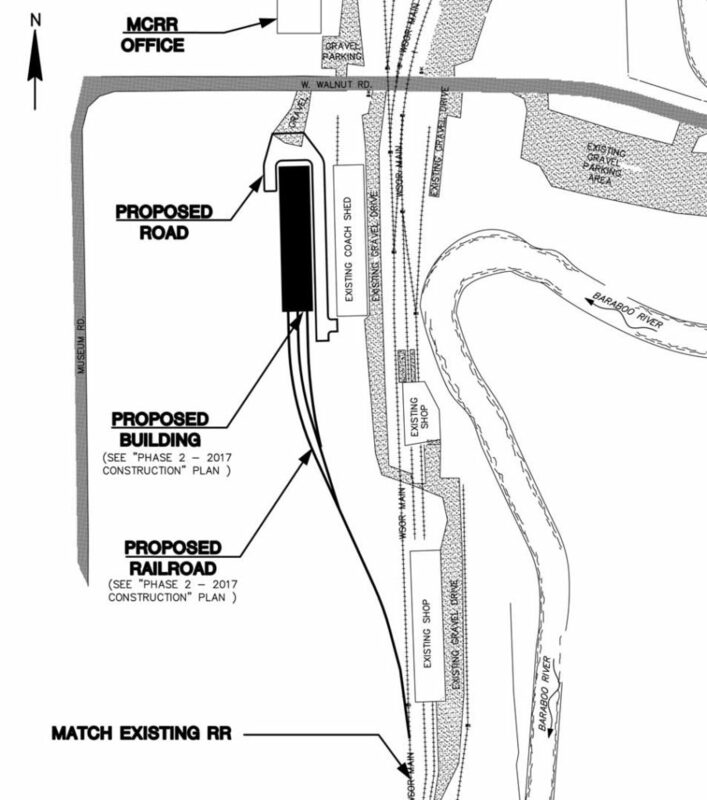 The final phase – construction of the nearly 1/3-mile of new railroad tracks to access the building – is anticipated to occur in spring 2018, assuming adequate funding is available to complete the task. Your support toward completion of this final stage is appreciated! Wall posts going up on the morning of October 20, 2017. On Wednesday, Nov. 15, 2017, Cleary Builders wrapped up installation of the walls and roof and windows. 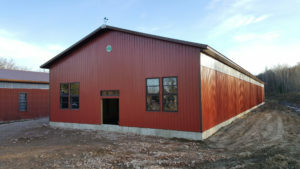 The building looks fantastic, although there is still a lot of work before the building can be put to use. The walk doors, three overhead doors in the rear of the building, lighting and electrical are yet to be installed. There is also no floor in the building as of yet. The building will have concrete walkways running the length of the building (an improvement over the brick walkways found in Coach Shed #1). With colder temperatures setting in, the pouring of concrete has been pushed back to the spring. Coach Shed #2 north end. Coach Shed #2 south end. Outside the structure itself there is still much work to be done. Many truckloads of rock need to be hauled in to form the roadbed of the new tracks and the ballest. 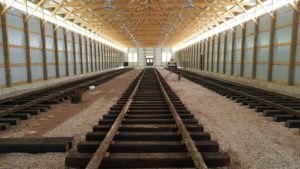 Trackwork will be completed next spring by Knapp Rail Builders, a railroad construction firm used by Mid-Continent numerous times in the past few years for larger-scale track projects. Ditches need to be further shaped and seeded and culverts installed. Walkways must also be placed between the entrance of Coach Shed 1 and the new building. Progress on the new display building has continued through December 2017 and January 2018. Walkdoors and the roll-up train doors have been installed. Inside the building, electricians have been busy installing wiring and lighting throughout the structure. Outside, as weather permits, the excavator has been adding finishing grading to the fire access lane that runs alongside the length of the structure. Since the last update, electrical service has been installed throughout the building. In addition to the translucent panels along the top of the walls, primary lighting is provided by 31 energy-efficient LED overhead lights. As a result, Coach Shed #2 will be noticeably brighter inside than Coach Shed #1. Abundant electrical outlets along the walls provide easy-to-access power sources for lighting and displays for the car interiors. 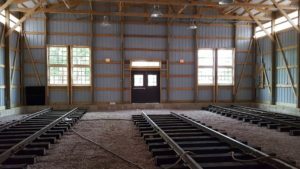 Electrical outlets were also installed on some of the trusses for easy access to power for cars located on the middle track. Automatically activated temperature control fans have been installed on the south end of the building. 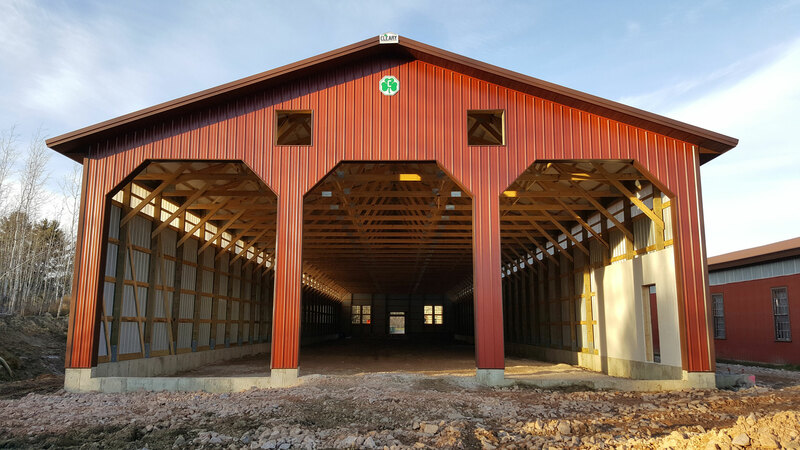 The fans, combined with the screened windows on the north end of the structure, will create an air flow through the building, maintaining more comfortable temperatures without relying on keeping doors open for air circulation – unlike Coach Shed #1. Additional landscaping, track installation and pouring the concrete floor is still on hold pending proper ground conditions and temperatures. Because of the uncertainty of the weather, it is not known when the work will be completed, but it is anticipated the building will be open to the public within 3-months time. The building sign has arrived. Coulee Signs of Holmen, Wis. has generously donated their time and materials for the creation of the sign pictured and a similar new sign to replace the faded and peeling Coach Shed #1 sign. The design of the new signs mimic the appearance of the Chicago & North Western depot signage style, present on the museum’s North Freedom depot. The new building is named in honor of the late Laurence Dorcy for his generous contribution that made constructing the structure possible. Sign that will be installed above Coach Shed #2’s main entry doors. 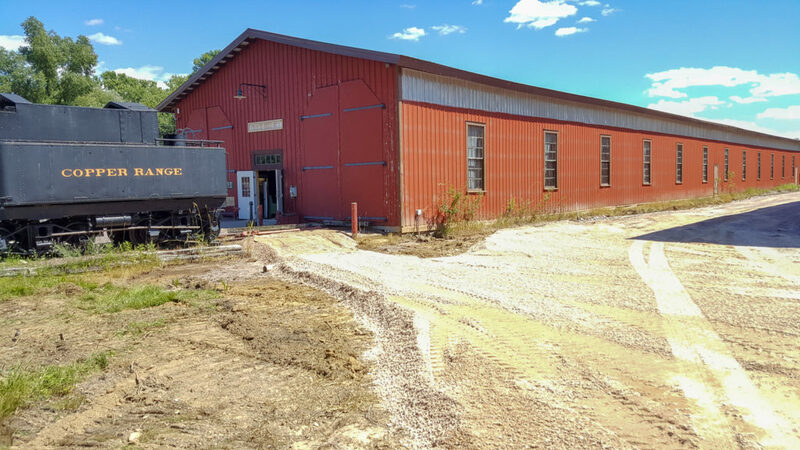 Rainy conditions persisting for much of early summer combined with the characteristically wet soil in the area slowed progress toward grading the new tracks servicing the building. However, dry ground inside the building did allow crews to install track within the structure. Crews also installed a new switch on the museum’s mainline that will connect the new structure to our existing track network. With the wet conditions finally subsiding, work on installing culverts and grading the final few hundred feet has resumed, after which, the track construction contractor can return to complete installation of the remaining track and final landscaping work can begin. Coach Shed #2 interior view after track installation, looking south. Coach Shed #2 interior view after track installation, looking north. Crews install a new switch in the Mid-Continent mainline which will connect the new display building. The new building is visible at far left. Grading for the new track is now complete. 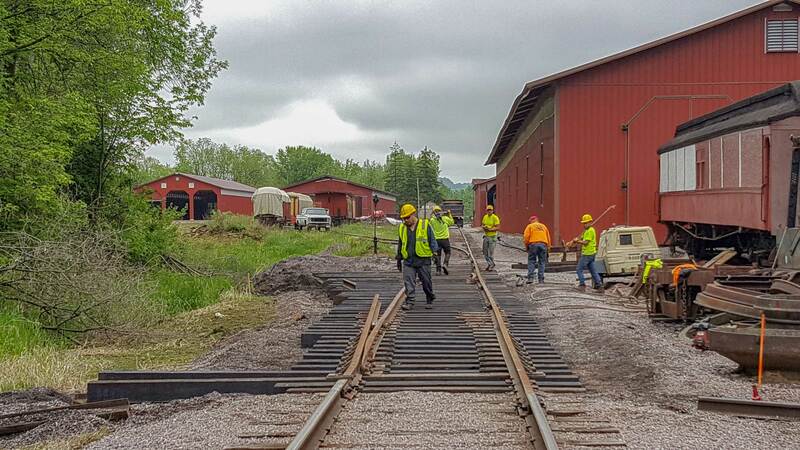 The next major step will be installation of the track from the mainline switch to the new building. Once the track is in place, the top layer of ballast will be added. New railroad grade leading to Coach Shed #2. In the meantime, some additional grading is being done to install a walkway to the new building from the existing Coach Shed #1. Grading work for walkway from Coach Shed #1 to Coach Shed #2. 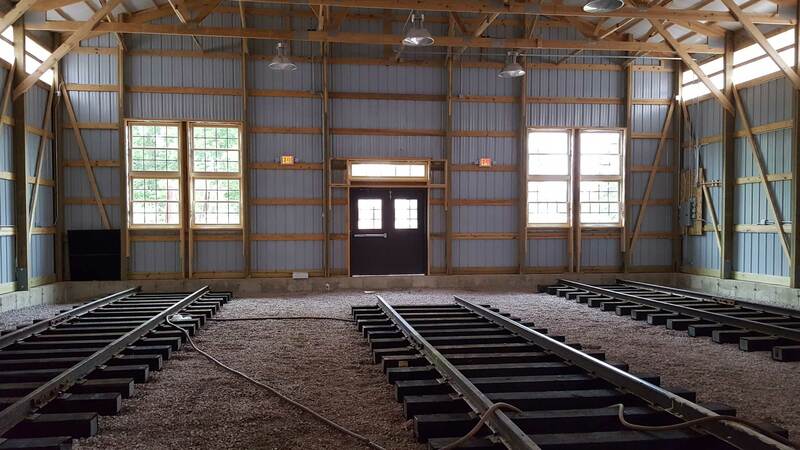 Scheduling conflicts have prevented our rail construction contractor from being able to come and complete the installation of the rails connecting the building to the museum’s mainline in July as planned. With the end of our 2018 operating season now less than two months away and time running short to complete the building and still have a chance to plan and send out invites for a grand opening ceremony, it has been determined that the building will not officially open until spring 2019. While a party to celebrate the official opening of the building will have to wait, depending on construction progress, a “soft opening” may still be possible in 2018. Flood damage ravaged Mid-Continent Railway on August 31, 2018, forcing the museum to close for nearly five weeks as repairs were carried out. The track construction contractor working building the tracks into Coach Shed #2 was diverted to instead focus on emergency washout repairs along Mid-Continent’s line and elsewhere in the region. 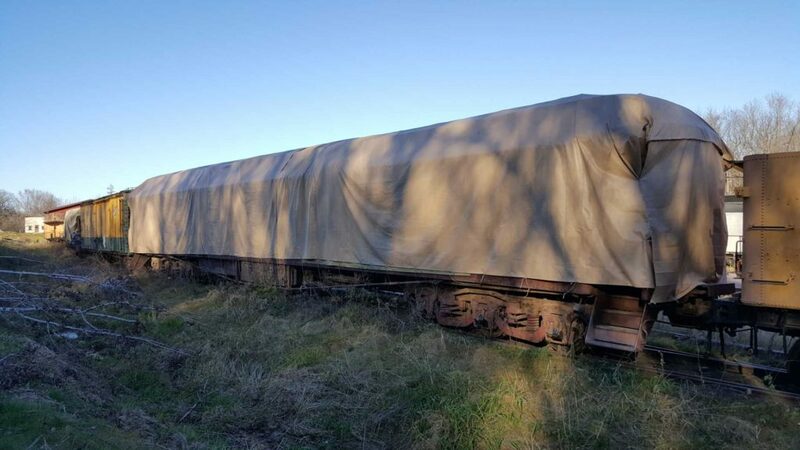 This, combined with saturated ground conditions, introduced further delays to work on the tracks into Coach Shed #2. Despite all that, the contractor was able to subsequently complete most, but not all of the track into the new building during November 2018 before ground freeze and snow cover halted further work. With spring now here, work will soon resume again. A great deal of snowmelt has generated very soft ground conditions which are currently preventing contractors from resuming work immediately, but they are expected to be able to resume work within the next few weeks. In the meantime, volunteers have started work producing new display signs to be installed inside Coach Shed #2 in preparation for the grand opening which is not yet scheduled. Mid-Continent Railway Historical Society, Inc., a not-for-profit Wisconsin Corporation, is an outdoor living history museum and operating railroad, and is accredited by the Internal Revenue Service as a 501(c)(3) organization. All contributions to Mid-Continent are tax deductible. To make a contribution, visit our Donation page. This is an update to our original post: Your Help is Needed to Complete Our New Display Building.